February is about to end and that means two months will be rolling to the 3rd month of the year already. Oh how time flies so fast right down our noses! What makes time pass us by faster is when we see our goals and dreams come into fruition. Time is only slow when you are lying on your bed and looking at the ceiling counting sheeps. Indeed, time is passing but you and I should do the moving. I have written down my goals for the year as well as the things I wanted to buy for myself and for the little house that I am building together with my husband. Looking at my list I just realized that my priorities have changed and I have more direction now. I am very thankful that I have matured in the way that I expected myself to be. I am making this year my year! Yes, I always say this as a new year unfolds. I have been very grateful of the many blessings that I have received for the past 29 years of my life and at this point I would be very selfish to wish more things for myself. I feel like I have been blessed so much that I am married to the most loving man in the world, that I am a part of an understanding and nurturing family, that I have a well-paying job, that I have friends to run to anytime I need them to share laughter and tears, that I was still able to wake up this morning. I am thankful for everything that I have in my life right now, down to the littlest detail. The things I want for myself now aren't material at all and that my dear readers are between me and my diary. Who knows, I may share it to you as well one of these days. I don't exactly know what is the ideal way to start my year but I know that I need to start my year right by being frugal and by being consciously aware of where my money goes or simply put spending wisely. I have a whole slew, in fact I have 10, must-have's to start the year right. While you read my list, prepare your own Top 10 must-have's as well and comment in this blog entry for you to get a chance to win Php10,000 worth of Sulit.com.ph gift certificates (details below). 1. CANON POWERSHOT S110 - I want to ignite the interest of our neighbor's kid who has shown curiosity when she saw my point and shoot camera. I know kids deserve support and that if we ignite their interests at an early age then they would be able to hone their skills and capabilities. 2. TAGALOG LEARNING PACK - I want to give this to my husband because I want him to learn my language. I wanted him to know how to speak as well as understand Tagalog because he dreams of settling here in the Philippines one day. I know that by giving him an avenue to learn, he will be empowered to live a much fuller life in a different country other than his own. 3. APPLE IPAD 4 16GB - I want to give this to my mom because lately she has grown to like playing games. These games relaxes her and that she finds solace in being able to spend time alone in her room. She's currently using the iPhone 3GS of my sister and a couple of days ago she hinted to me that she wants to have a tablet because it has bigger screen. 4. BROOKS ADRENALINE GTS 11 RUNNING SHOES - I want to give this to my uncle who has caught the running bug. I want to fuel his passion to live a healthier life by exercising. I want him to continue what he has started so that he would be able to maintain excellent health. 5. NIKON D3100 DSLR with KIT LENS, MINI-TRIPOD, SD CARD & BAG - I want to give this to my sister who has expressly mentioned that she wants to study photography. This will be a perfect choice for her to use as she dabbles in the road travelled by people with a knack for detail and beauty. 6. SOFA SET - I want to give this to my officemate who lost all his belongings and properties during Habagat. He is still trying to equip his house with furnitures and amenities up to today. I know that this little help would mean so much for him and I would just be more than happy to help. 7. BANIG - I want to give this to the homeless in our neighborhood that sleeps on pavements and concrete cement at night. Maybe a little cushion and protection would bring them the elusive comfort as they rest and sleep at night. I know this may not be much but we could always start somewhere. 8. THE TAO OF MOTIVATION BOOK - I want to give this to a friend who is demotivated lately and is feeling so down. I know that motivation is something that you cannot teach anyone but I am hoping that through this book my friend would be able to see the light and the larger picture of life. 9. SULIT VACATION IN CEBU PROMO PACKAGE WITH AIRFARE - I want to give this to my grandfather and grandmother. I wanted them to feel relaxed and well-rested and I know that this is something they deserve. I think my Lolo and Lola have never been in a vacation for so long. I want them to leave the hustles and bustles of their busy lives and just enjoy the moment in Cebu. 10. OLYMPIA CASH REGISTER - I want to give this to my brother-in-law. I wanted him to be able to have peace of mind that the sales of his business are kept in a secured place. He has a carwash in our province and the money are counted and accepted manually. Having a cash register would allow him to properly account and safekeep his sales every day. There you have it! I have shared my Top 10 must-have's for the people close to me and the strangers that I see everyday. I would like for you to share to me your Top 10 must-have's as well by going to the one-stop online marketplace, SULIT.COM.PH. If you want to get the latest item on sale or any information that you deem would help you as you shop online, keep them on your social network: FACEBOOK PAGE and TWITTER. Of course if you SHARE your TOP 10, you get a chance to WIN PHP10,000 worth of gift certificates. Five (5) lucky readers of the winning blogger will get a chance to win. How generous! 1. Like the FACEBOOK PAGE of Sulit.com.ph. 2. 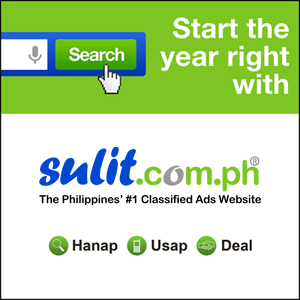 Follow Sulit.com.ph on TWITTER. TIP: You can use the Short URL of the product. If you have any questions, please let me know. Enjoy shopping! You have until March 5 to join.